Dressler D, Bhidayasiri R, Bohlega S, Chahidi A, Chung TM, Ebke M, Jacinto LJ, Kaji R, Koçer S, Kanovsky P, Micheli F, Orlova O, Paus S, Pirtosek Z, Relja M, Rosales RL, Sagástegui-Rodríguez JA, Schoenle PW, Shahidi GA, Timerbaeva S, Walter U, Saberi FA. Botulinum toxin (BT) therapy is an established treatment of spasticity due to stroke. For multiple sclerosis (MS) spasticity this is not the case. IAB-Interdisciplinary Working Group for Movement Disorders formed a task force to explore the use of BT therapy for treatment of MS spasticity. A formalised PubMed literature search produced 55 publications (3 randomised controlled trials, 3 interventional studies, 11 observational studies, 2 case studies, 35 reviews, 1 guideline) all unanimously favouring the use of BT therapy for MS spasticity. There is no reason to believe that BT should be less effective and safe in MS spasticity than it is in stroke spasticity. Recommendations include an update of the current prevalence of MS spasticity and its clinical features according to classifications used in movement disorders. Immunological data on MS patients already treated should be analysed with respect to frequencies of MS relapses and BT antibody formation. Registration authorities should expand registration of BT therapy for spasticity regardless of its aetiology. MS specialists should consider BT therapy for symptomatic treatment of spasticity. Spasticity (increased muscle tone anywhere in the body) affects around 74% of PwMS experience it (bearing in mind that there are no accurate figures for this); of which 47% are classified as Ashworth score >/=2 (i.e. marked increase in tone but able to move the affected limbs easily; Barnes MP (2003) Spasticity in multiple sclerosis. Neurorehabil Neural Repair 17:66–70). Spasticity is defined as a “motor disorder characterized by a velocity-dependent increase in tonic stretch reflexes with exaggerated tendon jerks resulting from hyperexcitability of the stretch reflex”. In my books spasticity is a definite low low for those I review in clinic, overshadowing any improvements, or status quo achieved in other problem areas. I have recently been looking into the application of botox in spasticity management and this literature summary demonstrates that it has a role in management. This needs to be done before contractures arise, wherein the spastic postures become fixed and botox would be ineffective. The IAB-Interdisciplinary Working Group for Movement Disorders state in this review that there is robust evidence to support the use of botox in MS spasticity, quoting 3 randomised controlled trials (Table 1, see below) and 3 interventional studies (Table 2, see below), and therefore are overwhelmingly in favor of botox use. In practical terms botox is only available in specialist centres and has high reimbursement costs for the health service (i.e. expensive). However, more clinicians and PwMS need to be aware of it as a potential option in MS managment. 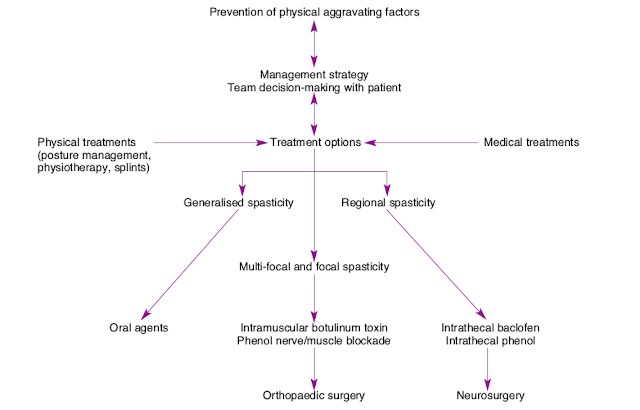 Figure 1 is a management algorithm from the Royal College of Physicians for adults with spasticity. "Raghavan and colleagues developed an alternative theory for the cause of muscle stiffness following a central nervous system injury they call the “Hyaluronan Hypothesis.” It postulates that the accumulation of hyaluronan—a sugar molecule and common lubricant in joints and muscles—promotes the development of muscle stiffness. When a brain injury limits a person’s mobility, hyaluronan thickens like honey, which can lead to abnormal sliding of muscle fibers and result in stiffness. Therefore, the researchers believed that an enzyme that breaks down such molecular sugar chains, called hyaluronidase, may reduce their concentration in muscles to reduce stiffness and increase joint movement. Prior to the injections, 50.6 percent of the joints tested showed moderate stiffness and 44.4 percent of the joints tested showed severe stiffness, as captured by the Modified Ashworth Scale, a standard measure of stiffness. This number dropped to 15.3 percent with moderate stiffness and 5.8 percent with severe stiffness within 2 weeks of the injections." This work is tageted at arthritis, spasticity related stiffness is about tendons/muscle/nerve. I have increased tone in my calf muscles on one leg. It impairs the effective functioning of my FES and any AFO that I have tried. I know someone in the states who had botox in calf and then a serial cast for a month to stretch the muscle. Cant find anyone here that will let me try anything other than baclofen. I have just bought a night splint and when sitting I put it on to try and lengthen the shortened muscle. My walking is always better afterwards for about half an hour. There are currently only a few centres who offer Botox primarily those linked to rehabilitation units in the UK. Get your GP/primary care physician to find out for you.